Mix 3 tbsp clear honey, 2 tbsp wholegrain mustard and 2 tbsp olive oil together and season. Arrange 500g parsnips, peeled and halved, cut side up in a roasting tin and drizzle over the honey mixture. 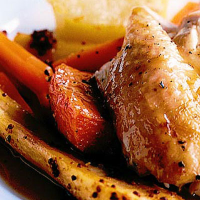 Roast for 35–40 minutes, stirring halfway through, until tender and golden.